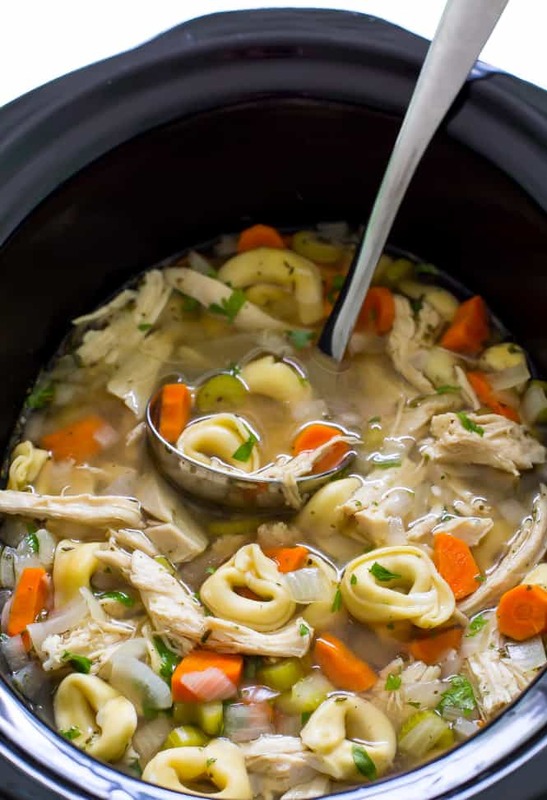 Super Easy Slow Cooker Chicken Tortellini Soup. Loaded with tons of veggies, shredded chicken and cheesy tortellini! Hi guys! It’s Kelley back from Chef Savvy! Today I am sharing with you my Slow Cooker Chicken Tortellini Soup! This soup is loaded with veggies, shredded chicken and cheese tortellini. It’s a fun and easy twist on the classic chicken noodle soup. Best of all this soup is made in a slow cooker. That means little to no prep time and lots of flavor. This soup simmers low and slow for 6 hours! 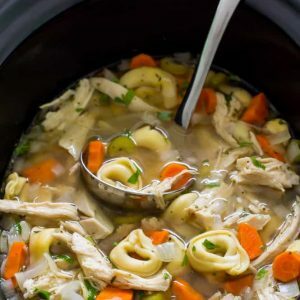 This Slow Cooker Chicken Tortellini Soup is super easy to make. Simply add all of the ingredients to the slow cooker except for the tortellini. I like to add them in about 15 minutes before serving so they don’t get mushy. Serve this soup with some crusty bread and a nice salad and enjoy! 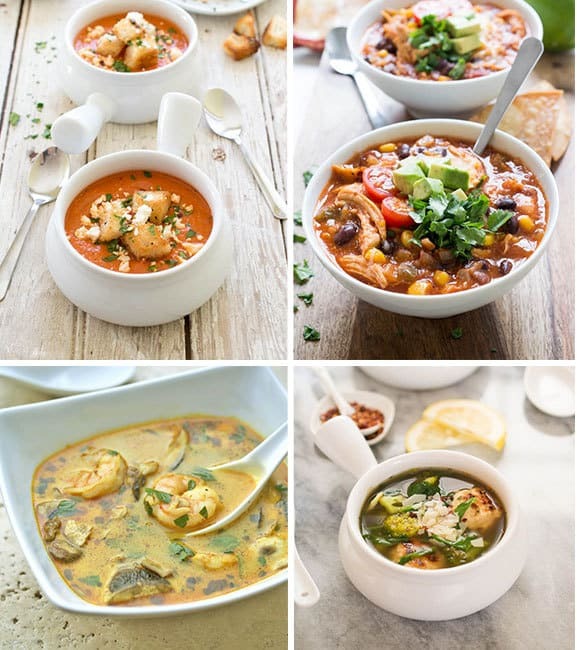 Looking for some more Soup Recipes? Here are a few of my favorites below! Made this for the family last night and we absolutely LOVED it. Will become a regular at our house. For anyone who says it lacks flavor, remember SALT IS YOUR FRIEND. Even a rich, slow simmered stock will taste bland at first. But add salt and the natural flavors magically appear. You might feel like you’re adding too much salt at the end but don’t worry because I guarantee your soup will still have way less sodium than comercially prepared soup. Also a few grinds of black pepper in the end give it a nice kick as well. OOoops – forgot to rate it: 5 STARS!!!! I skipped adding in the water and also added in extra Italian seasoning, some dry dill and then also added in a packet of dry onion soup mix instead of adding chopped onion. It was flavorful and so delicious. I also tossed the veggies in some Lawrys seasoning salt before adding them to the broth and cooking. I believe this really helped the with overall flavor. Can you cook This recipe on high for 3-4 hours instead of low for 6? I would like to make it tonight but started it late. Thank you! This recipe is easy enough for beginners and provides a great basis for a delicious meal! I always season and sauté my chicken, then the vegetables in the same pan. I also use a chicken stock instead of the broth and add an extra cup (instead of the water.) Without the extra seasoning and sautéing, the recipe is quite bland. You could always chop up your veggies the night before to make this a super quick, hasslefree morning! I pair this soup with a tomato, basil grilled mozzarella cheese sandwich. Yum! I have everything in the slow cooker now and it already has the house smelling marvelous! Bon appetite! Instead of chicken breasts which have no flavor use chicken thighs then take them out and shred the chicken and add it to the pot. Thighs have fat so it gives the soup good flavor. I added bouillon cubes to the broth and water. No bay leaves as I did not have any. This lacks flavor, but that can be remedied quickly! I used 1 tsp salt, 1/2 tsp black pepper,4 tsp ital seasoning, 2 tsp parsley, 2 bay leaves (but I’m not sure if they still had flavor). How should I adjust the time (if at all) if I don’t use any chicken at all? Thank you! Can’t wait to try it tomorrow! Love the soup! I added a few handfuls of spinach after the Tortola I were cooked. Then a little bit of fresh grated Parmesan cheese. can u use frozen chicken breast for slowcooker chicken tortellini soup recipe? Made this recipe today but added a few items and made some changes. First seasoned 2 boneless skinless chicken breasts and one chicken thigh with bone and skin with salt and pepper. Then browned rhe onion and celery. Put all in slow cooker along with about twice the amount of Italian seasoning, a medium can of diced Italian tomatoes a generous amount of parsley, about a half pound of carrots, and about 7 cups of chicken stock. Cooked on high for 4 hours. Shredded the chicken, retuned it to pot and tested the flavor. Was perfect. Added whole pkg of tortellini ack cooked for about 10 minutes. This was outstanding. New keeper for sure. 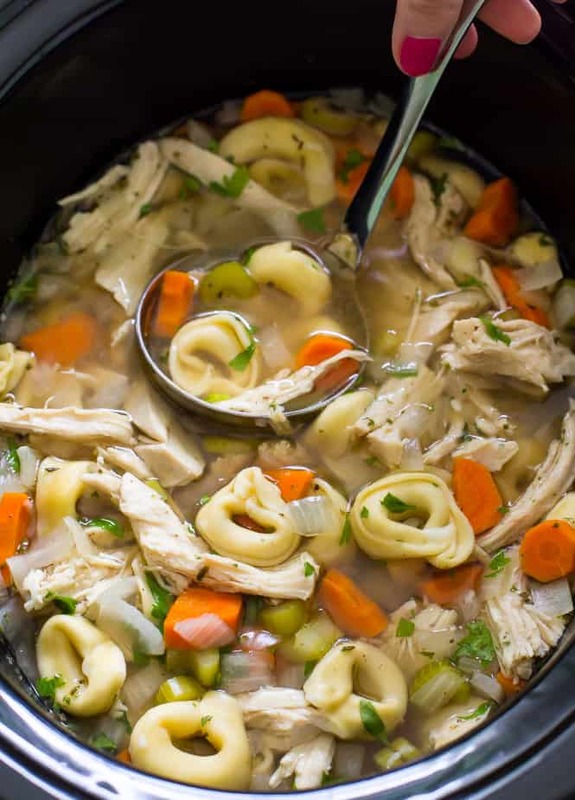 For the SLOW COOKER CHICKEN TORTELLINI SOUP, can you substitute the Tortellini for some other pasta as my husband doesn’t care for thick pasta in soups! Hi…I know this says it serves 4, but I was wondering if you could give a what the serving size would be in cups? thank you! Can this be cooked on high instead, if so for how long? Also would I still add pasta at last 15min if I got the refrigerated tortellini? Thanks. This looks really delicious. I’m not a big fan of Italian seasoning. Is there another seasoning you perhaps could recommend?? You are welcome to brake up the Italian seasoning and pick and choose which seasonings you prefer out of the list of ingredients in the seasoning. How long can the soup be refrigerated after you make it ? Hello, i’m new here and i would like to make this soup but i don’t own a slow cooker. Is it possible to make it in the oven? I made this over the weekend and it was perfect comfort food for my daughters cold. Its not letting me give it 5 stars!! Now sure why! And, I wonder if there’s a way to thicken this up or add some creaminess? Yes, that is the best! This was my first crockpot soup! I have always made soup on the stove top, but I think I will be making soups in my crockpot from now on! So nice to not have to attend to the soup as it cooks! My husband said that this Chicken Tortellini Soup seemed like it came from a fancy restaurant. We both liked the tortellini in the soup. Have only had tortellini with tomato sauce before this. I think I will eliminate the garlic, Italian seasoning and bay leaves next time, though. It seemed too spicy to me. I took the suggestion from the comments to cook the chicken in a skillet and also cook the vegetables before adding everything to the crockpot. Very delicious that way! I used a bit of butter in cooking the chicken and the vegetables and cut up the chicken before I cooked it in the skillet. Thank you for inspiring me to learn new ways of making soup! Hi. This looks delicious! Do you have the nutritional information per serving? Thanks! Cheese tortellini in my store comes dried, fresh and frozen; which did you use? If dried do you cook it first? If frozen do you defrost? Fresh or frozen tortellini for the soup? Thank you! This soup was a family hit! I wasn’t organized enough to throw this in a crockpot so I used my multipot instead (frozen chicken and all). In 20 minutes I had a full flavor soup and my house smelled amazing. Only other deviation from recipe was I added zucchini, because I had some that needed to be used. We are already looking forward to enjoying this soup again. What is the nutritional information on this dish? I’d like to make this in an Instant Pot, rather than a slow cooker. Plan to sautée the chicken pieces briefly in the IP to improve their flavor, reduce the amount of liquid and add the tortellini in at the same time. Based on the amount of chicken, I’m thinking an 8 minute cook, with quick release of the pressure. super tasty & great recipe, took more like 7.5 hours in my slow cooker for the onions to break down and become soft enough. garlic i had went bad so used garlic powder and tasted great! How can I make the broth a little thick and creamy? You are welcome to add in flour, milk or whipping cream to make it thick and creamy. It may alter the taste and texture though.